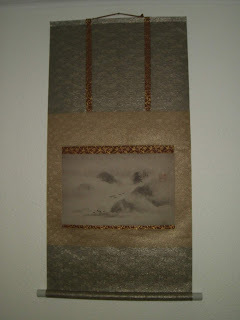 This is another sample of a customers sousho or full cursive Japanese calligraphy. It was mounted in a sandan Hyougu style, to help bring a little austerity to the informality of the writing. 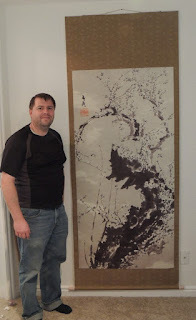 This calligraphy was brushed by an artist in the midwest. They sent this to me for mounting. I mounted this in a Fukuro Hyougu style. The simple mounting seems to match the full cursive style of the writing. It is finished with a ceramic jikusaki and takuboku hanging string. If you would like to have a custom piece of art mounted into a wallscroll, please contact to me at sales@customjapanesecalligraphy.com. This was the most difficult scroll to make in the group because of the size of the painting. The resulting scroll took up an entire section on a 4'x8' drying board when making. Needless to say I spent a lot of time on my knees for this one. 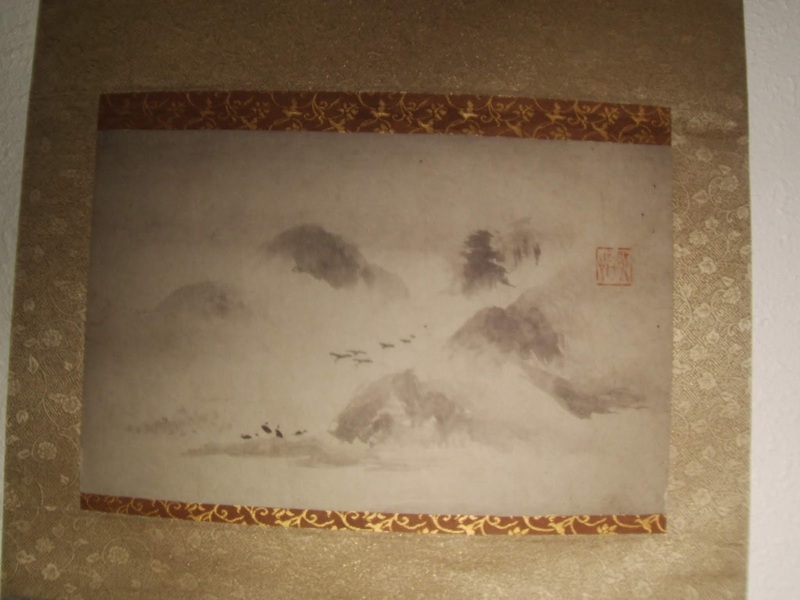 I love the beautiful layering and depths of the different shades of sumi on this painting. It is very rich and complex. The simple scroll design with a brown cloth containing a very demure karakusa helps to bring out the beauty of this painting.